Welcome to NANAIRO REINCARNAION trophy guide. 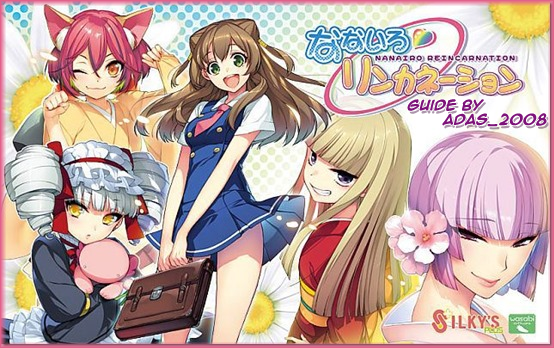 Game is easy and short visual novel with fast skip and (I think) scene skipping feature. I will start with informing all readers that I learned this plat the hard way (used not vita jp guide) so it might not be the best solution to fast plat this. I hope there will be comments from Merlin, Nukes or others who got plat in this - all changes I will add to this guide. At first The game will ask you to install it. You need 11 MB of free space. I don't know if it will work faster that way. Main menu has descriptions in English so picture is not needed. PRESS for Auto Skip (no need to hold) or use touchscreen swipping from left to right. CAUTION! This game has slide left side sub menu. In there you got two options NEXT and BACK. You can use it for skiping ahead (will stop at next choice). Althought you will not be able to use it on your first PT. There will be a movie here - no way to skip it in first PT. From now on there will be new option on the MAIN MENU called BONUS MODE. Go there and enter all three menus (CG, MUSIC, SCENE). In each of these press CIRCLE to see, listen and watch at least one piece. It is for seeing all text in the game. For this trophy we made these additional saves and we will use them now. Guide says SKIP until trophy pops. I can not confirm is it to the end or earlier as I did it different way. Guide is finish and I hope complete enough so you will get the platinum. Any suggestion, changes please write in comments. I will use them to make this guide better. As I wrote in the beginning I used wrong jp guide and was missing this READ ALL TEXT trophy after following it. Hope someone who plat this will confirm my methods works. I think it is safe to say this guide can now be moved over since it is tested and works. Fantastic job Adas, the guide is flawless. Thanks for the guide adas. I´ve used the slide option and tada.... WR time in 1h45min. Perfect Guide! Thank's alot for the Help adas_2008! Thank you for the perfect guide with no issues encounter except one of the routes (Load Save 1) screen-froze while skipping. The error was more of a software issue I thought people should know in case they have the same situation. The screen will be frozen and noting will interact with the buttons.Forcing you to close-out and reboot the game.